Parents are encouraged to schedule appointments with their children’s primary care doctor or physician. Families who do not have a primary care doctor or who have difficulty accessing medical care may benefit from free clinics held in August. 8 am – 2 pm, Tuesday, Aug. 7, at Washington Middle School, 2300 E. Jackson St., and Grant Middle School, 1800 W. Monroe St.
9 am – noon, Saturday, Aug. 11, Springfield High School, 101 S. Lewis St. 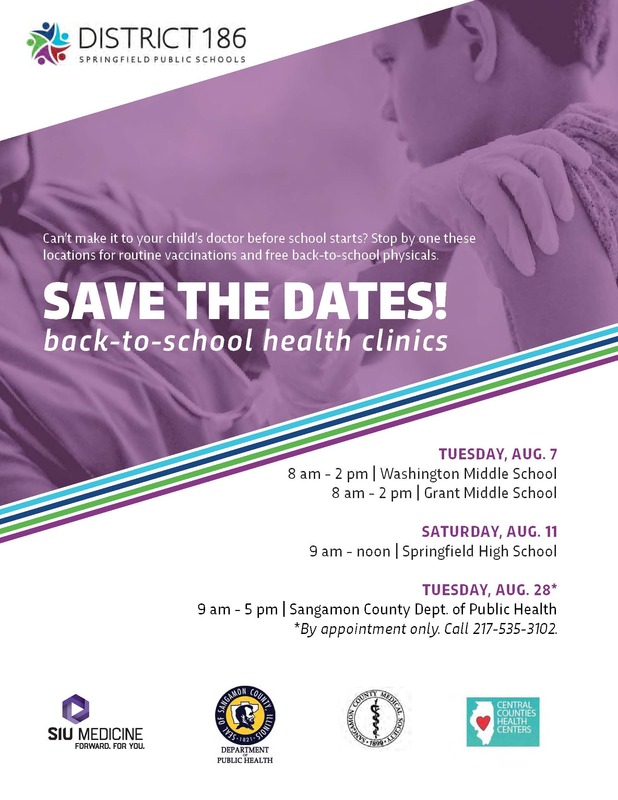 The Sangamon County Department of Public Health, 2833 S. Grand Ave. East, will also provide physicals and vaccines by appointment only from 9 am – 5 pm, Tuesday, Aug. 28. To schedule an appointment, call 217-535-3102. Only students currently attending or entering District 186 are eligible for the physicals. A small charge for immunizations will be billed to the parent’s or guardian’s insurance. Sports physicals will not be offered. District 186 schools begin the 2018-19 school year on Monday, Aug. 20. All required health information is due on the first day of school, or it can be turned in at registration on Aug. 6-7. 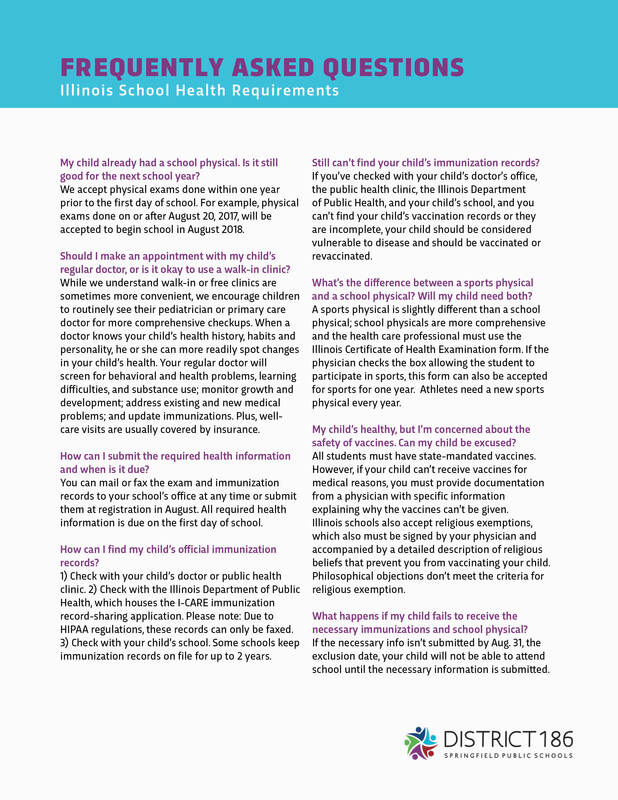 Failure to provide required health information will result in students being excluded from school on Sept. 4. Students will not be allowed to return to school until all required health information is received by the student’s school. The Keep Kids in School Coalition, a collaboration among Southern Illinois University School of Medicine, Springfield Public Schools District 186, Central Counties Health Center, Sangamon County Department of Public Health, Midwest Technical Institute, St. John’s College of Nursing, St. Clare’s Health Clinic at Catholic Charities and the Sangamon County Medical Society, is sponsoring the clinics. The coalition’s goal is to provide students with access to doctors who can provide physical exams and immunizations. Parents who have questions about vaccines should talk with their primary care physician, pediatrician or local public health department. For more information about the clinics, call the student support services at 217-525-3060. 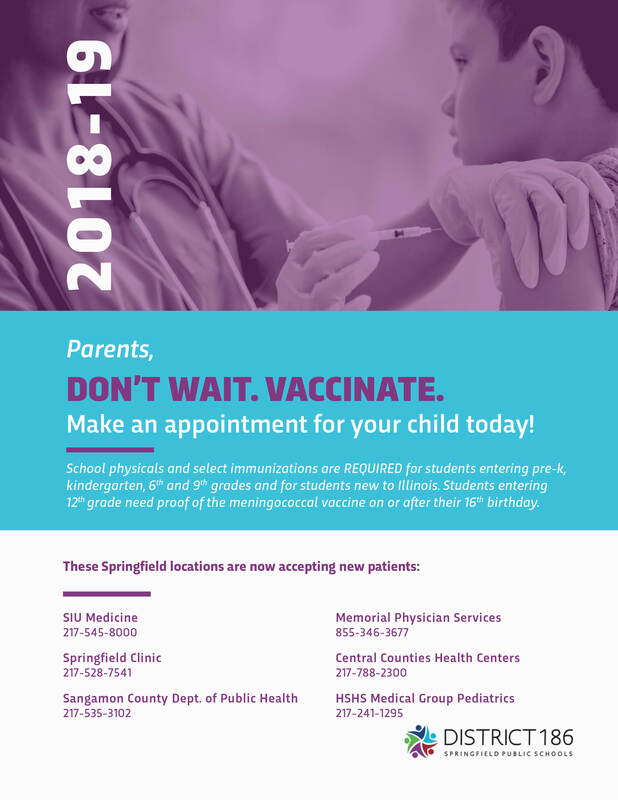 ► Pre-K, kindergarten, 6th grade, 9th grade students and students new to District 186 must provide a current physical exam and updated immunization record. ► All 6th grade students must show proof of having received a Tdap vaccine and 2 doses of varicella. One dose of Meningococcal vaccine must be received on or after the 11th birthday. 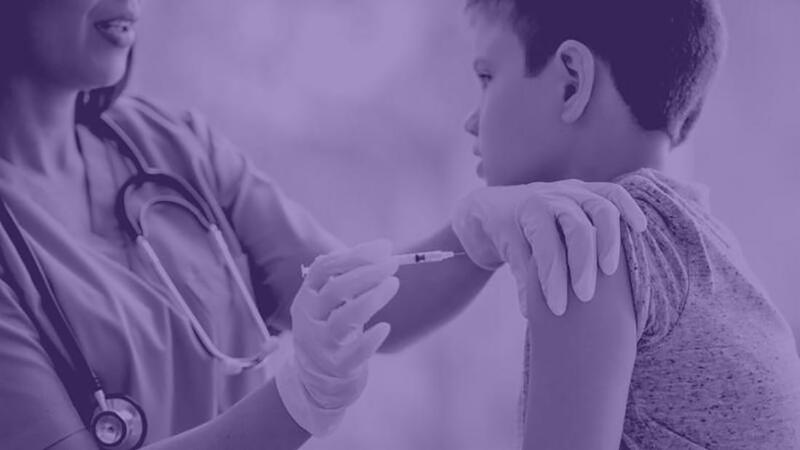 ► All 12th grade students must provide proof of having received a dose of Meningococcal vaccine on or after their 16th birthday. ► Kindergarten, 2nd and 6th grade students need a dental exam. ► Kindergarten students and students new to Illinois schools need a vision exam. Contact Nalo Mitchell at nalom@sps186.org or 217.545.3047 with any questions.